Shinzo Abe's golf diplomacy in Florida charts a path for foreign leaders with the Trump administration: use strategic patience and reap rewards (though remember, you could always end up in the sand traps). Japanese Prime Minister Shinzo Abe and US President Donald Trump held a press conference at the Mar-a-Lago club on Saturday. Abe spoke in Japanese, condemning North Koreans for firing a ballistic missile. He stood in a ballroom at the president's club, a room set up quickly for the event. It was decorated with two sets of US and Japanese flags, and a dance track from a nearby wedding party was playing softly in the background. In the diplomatic realm, the Japanese are known for their attention to detail and understated manner - and for their discretion. This press conference - and summit - were different. Instead of Camp David, which is located in rural Maryland, or Sunnylands in California, where Obama hosted world leaders, Trump invited Abe to his private club in Florida. They walked around the premises in full view of the other guests - many of whom were attending the wedding party. White napkins littered the grounds, and guests strolled across a patio. A string of Molly's Trolleys (with air conditioning and wooden benches) waited in the parking lot to take the wedding guests away after the party. Abe must have wondered what he'd gotten himself into. Trump also seemed uncomfortable - at least when he was talking about diplomatic affairs. "The United States of America stands behind Japan, its great ally, 100%," he said during the press conference. He spoke in a clipped manner. Abe was clearly more at ease in the world of international security issues and geopolitics than Trump. Abe had a calm manner, and the president played a supporting role. In this way Abe gave Trump a lesson in diplomacy. Trump's background as a businessman differentiates him from any US president before him, and his approach to global affairs has been unusual. He's been combative on the global stage, accusing Japan and other nations of trying to hoodwink the US. Understanding his worldview and developing a relationship with him has been a challenge for foreign leaders. Abe seems to have met this challenge - for now. Things started out rocky: Abe didn't want Trump to cancel plans for a trade pact, the Trans-Pacific Partnership (TPP), or at least not right away. The president crushed it. Abe moved on, working to ensure good relations between Japan and the US. Japan is one of the most important US allies, and their relationship has been a key part of US policy in Asia. Abe wanted to make sure the US would continue to help him and the other officials in Tokyo maintain security in the region. Then Trump said the Japanese were trying to influence financial markets so they could compete unfairly against the US. "They play the money market," he said, "and we sit there like a bunch of dummies." Economists were baffled by his claims. "He's just shooting from the hip," the Harvard economist Kenneth Rogoff told me, saying Trump's accusations against the Japanese were unfounded - and that his understanding of Japan and the markets was fuzzy. "I guess what remains to be seen is how educable he is," said Rogoff. This was Abe's mission for the weekend: to educate the president without making him mad. "I think the goal was completely achieved," Columbia University's Takatoshi Ito, who specialises in finance, said. "Abe and Trump became good friends and had good chemistry." Even former Obama officials - or some of them - were impressed. "It was good for both sides to have an early summit," said Mark Lippert, who served as the ambassador to South Korea. 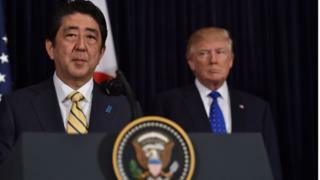 He said that the weekend Abe and Trump spent together in Florida helped to underscore the importance of the US-Japan alliance. In this way Abe may have created a model for other world leaders and foreign diplomats who are attempting to chart a course with the new administration. "In some ways maybe he's setting the template for how US allies can deal with Trump," said Eric Altbach, who served on the National Security Council under President George W Bush. Abe's secret has been to carefully build a relationship with the president, acting authoritative at times but also showing respect. Still, Ito acknowledged that the strategy could backfire. "It's like a personal relationship," Ito said. "You have to take risk, but it's a calculated risk." "I would be wary," said Jeremy Shapiro, who worked for the State Department during the Obama administration. Shapiro said other world leaders had tried to cultivate good relations with Trump - and got burned. Prime Minister Theresa May of Britain had a press conference with the president last month. Shortly afterwards Trump signed an order for a travel ban that infuriated Britons and embarrassed May. She struggled to maintain her good relations with the president while dealing with the fallout at home. The contrasting styles of the two leaders - and the challenges in building a relationship - were apparent at dinner. At one point Trump stood up from the table, calling out to a friend, the owner of a football team, who was sitting across from him. Abe sat quietly. His hands were folded in front of him. Luckily they shared a passion for golf - and played the following day at Trump National Golf Club, travelling there in a motorcade that took up three lanes of a highway. That evening the president spoke with me and other reporters about their outing. "We got to know each other very, very well," the president said, answering my question about the golf game. Not long afterwards we were called for the press conference - and watched Abe smoothly move into a position of power. Trump was uncharacteristically quiet during the press event. He didn't seem "fully briefed up" on North Korea, said Altbach. Afterwards Stephen Bannon, the chief White House strategist, and an aide stepped into the room. The aide was holding a copy of a speech entitled "POTUS remarks", which was shown in a Reuters photograph. It seemed to be a copy of Trump's speech, describing North Korea's actions as "provocative". The president chose different words, though, and let Abe do most of the talking. For a US president, that's unconventional. In another departure, the White House did not issue an official statement, the way Democratic and Republican presidents have traditionally done after a missile test. A White House aide told me they believed things had been taken care of during the press event - and saw no need for a statement. "It's unusual," Altbach told me. "Normally the president would issue a full statement on a missile test." Normally, though, the president has a background in international relations and is surrounded by aides who are steeped in statecraft lore. With Trump, said Altbach: "There's a learning curve." With his cordial relations towards Abe - and a close, new relationship with Japan, an important US ally - Trump gives the impression he's becoming like "a normal president", said Shapiro. Yet Trump is likely to continue on an unpredictable course in his dealings with Abe and other world leaders, said Shapiro, adding that a good motto for the administration is: "Stay tuned."